Hello. Over the last four decades I have come across defective factory ammunition right out of the box that should have never left the factory. 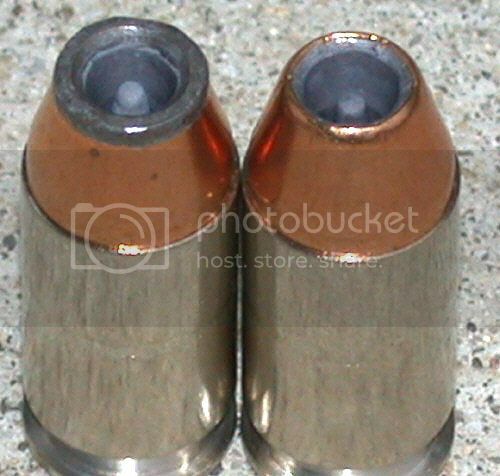 In some instances, primers were seated upside down or completely missing, cases were crushed or the bullets themselves were visually out of spec. Though certainly not common, I have seen defective factory rounds from practically all manufacturers, not just Federal. While a little unnerving, I guess that when hundreds of thousands (or more) of cartridges are being manufactured, some that shouldn't slip by, do, despite quality-control checks. 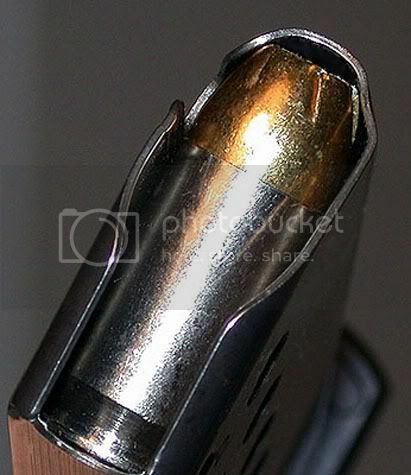 My point is not to try and "defame" any reputable ammo makers, only to suggest that it is perhaps a wise thing to check each and every cartridge intended for "serious" use such as home defense or in a carry gun...and in all magazines dedicated for such purposes. I routinely do this with all ammunition intended for such purposes, be it for rifle, revolver or semiautomatic. A few weeks ago, I shot my SIG-Sauer P220 DAK, cleaned it upon returning home and locked it away in the safe. A day or two ago, I opted to load it up for home protection as well as for concealed carry for about a month in order to do a follow-up article to one done on the gun a year or two back. 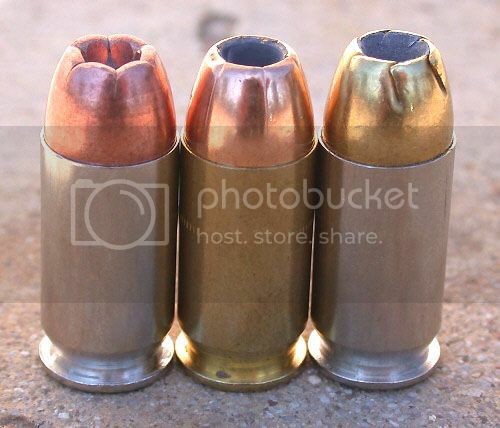 When I carry a .45 auto, it is usually loaded with one of these three 230-gr factory JHP's. From left to right: Winchester Ranger, Federal Classic and Remington Golden Saber. Remington's 230-gr. Golden Saber is easy to spot as being slightly longer and usually measures right at 1.23" on average. I began loading a couple of magazines for my P220 DAK SAS ("SIG Anti-Snag) .45 pistol with Golden Sabers. This round has proven to feed smoothly in all of my 1911-pattern pistols as well as this and my other P220 as well as one I recently sold. The magazines were brand new ones. The ammunition "jammed" in one of them". LOA for the Golden Sabers was the usual 1.23" on average. I checked the LOA of cartridges from the box these came from against others having a different lot number; both had the same average LOA. Here you can see the "nose-dived" Golden Saber. In this particular instance, it was the last round in the magazine but this stoppage also occurred with differing numbers of cartridges still in the magazine. Here is a view of the same problem from the top. 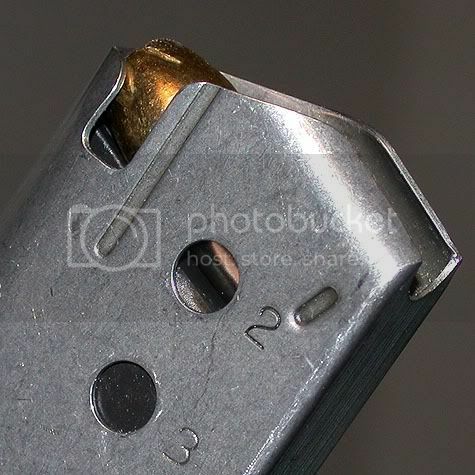 The "inward curved" front of the magazine (about the 2 o'clock position) does not appear to be a "ding" or other than intended from the manufacturer. 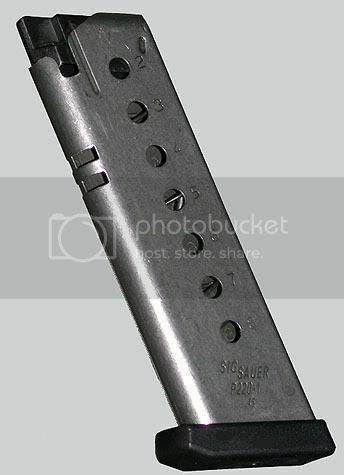 My other stainless 8-round P220 factory magazines are the same way and function fine with the same ammunition. My point is not to criticize Remington, SIG-Sauer or Mec-Gar. It is simply to suggest not taking any product's functioning or "dimensional correctness" out of the box for granted. This problem-combination just happened to be the latest I experienced. Such "unintended consequences" could be aggravating at the least on a range trip or tragic in the extreme in a deadly force situation. Just because it's supposed to work doesn't mean it will. Mr. Murphy is on the job 24-7-365 and he doesn't care who you are he'll make your gear foul up at the worst time. Never assume it'll work. Check, check again, then triple check. Stephen A. Camp wrote: Hello. Over the last four decades I have come across defective factory ammunition right out of the box that should have never left the factory. In some instances, primers were seated upside down or completely missing, cases were crushed or the bullets themselves were visually out of spec. The same goes for people who universally criticize handloads. Thanks for the reminder. Check your gear! Any mag in a defense weapon that messes up once in training gets cleaned and inspected. It also gets marked. If it has another blip in any capacity it is crushed and destroyed. Mags are cheap - life is valuable is what I've heard said regarding this topic. This goes for rifles and handguns. I've seen the nose of the bullet get flattened out after significant time in a magazine AND with the person (in this case security officers) patrolling back desert roads.